My mother-in-law Ethel recently passed away; she was 98 years old. Born in the mountains above West Kelowna to a farming family in 1918, she had little access to formal education beyond the 8th grade. To say that she and I had different learning environments and styles is an enormous understatement. How can I compare my learning opportunities to someone that was born almost a hundred years ago? Ethel spent most of her life without access to Google, Internet resources, and Word processors. Of course, she could read and write very well because the bible was her required reading, and she did not have the luxury of spell-check or grammar-check. She could compose a brilliant letter, and recount an anecdote so well that you would swear that you’d been present. 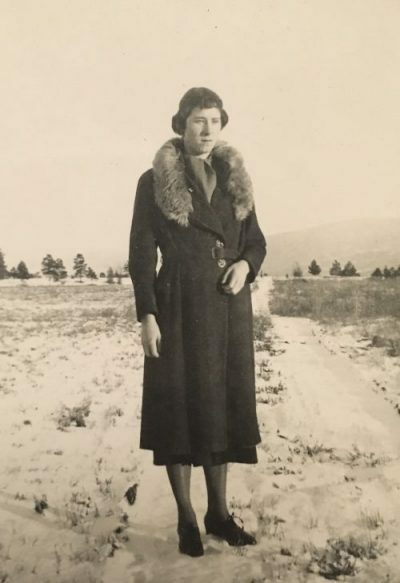 Ethel could identify all the local Okanagan flora and fauna, she knew the planting and pruning, and harvesting schedule of crops, she knew how to milk a cow, and pluck a chicken, and could protect her precious livestock from predators. She could use an axe and a saw. She could bake bread, and sew, and knit, and preserve food, and, and, and. All of this she committed to memory following detailed direction from her parents, siblings, and the people in her community. It was hands-on learning with little, if any, room for error. It was survival. This was her learning style, and her teaching style was un-paralleled for someone without a formal education. Ethel’s direction was painstaking yet patient: the ultimate positive learning environment whereas the instructor gives the student all the information that they will need to succeed and then allows them to master the lesson. Success is the only option! How did Ethel do this? She had to be a sponge. She had no choice except to remember, and reenact what was being taught. There were no handouts and no Internet. A set of encyclopedias were the closest that a (wealthy) family would come to reference material, and her family was not wealthy. Her brain was programmed to focus and remember; she did not receive reminders and alerts, and there was no Siri. Assessment was key, but a learning “style” was not an option. Ethel taught me how to drive, garden, cook, and parent. She and I could not have been more different. At times, she was brutally honest, but I could never negate her direction because she was usually right, and I came from a generation of second-guessers. Ethel knew her stuff. The point of this post is that I’ve completed the Curriculum Development 3210 course in the Provincial Instructor Diploma Program at VCC. There are three reflections in my PIDP 3210 pages, but the focus of the course was developing a hypothetical lesson; all the Course Profile, Lesson Plan, and Course Outline assignments are on my 3210 pages as well. I’ve realized that while I cannot compare myself to Ethel’s expertise in the above-mentioned life skills, my “expertise” in Oral Surgery and the role of the Certified Dental Assistant is comparable. I would love to develop an actual course for CDA’s entering the specialty of Oral & Maxillofacial Surgery one day because it doesn’t exist, and I do consider myself an “expert.” For now, I must settle for remembering all the lessons that Ethel taught me, the most important of which is to focus and have confidence. Enacting with conviction what you have learned is the ultimate measure of intelligence. I miss her. This entry was posted in Education, Provincial Instructor Diploma Program and tagged Okanagan Icon on December 6, 2016 by kathryn truant. This was very well written. Brought tears to my eyes. Nana was so amazing I feel so blessed to have her for as long as I did. I miss her to.